During the 2011 and 2013 Texas Legislative Sessions, FARFA worked to pass the Cottage Food Bill, legalizing sale of non-potentially hazardous foods prepared in home kitchens. Those sales were only allowed within a specific framework: direct-to-consumer, within a list of very specific foods, and limited to $50,000 in annual sales. Despite the restrictions, a Forbes magazine article estimated that more than 1,000 new businesses have been created under the law. However, the limitations on what can be produced and where the food can be sold limits the cottage food law’s usefulness for many farmers and food producers. The Homemade Foods Bill, sponsored by Representative Eddie Rodriguez, creates a middle tier of regulation that addresses genuine concerns about the risks of the food and expanded distribution, while still providing realistic opportunity for home production. 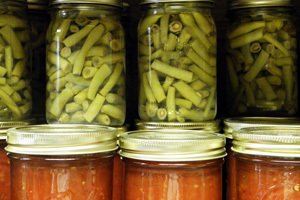 HB 1926 allows home preparation of foods such as tamales, canned vegetables, fermented foods, and perishable (potentially hazardous) baked goods. Sales would be allowed anywhere in the state, including through mail order and internet sales, as long as the producer and consumer are both in Texas. This means that farmers who have unsold vegetables at the end of a farmers’ market may can those vegetables for sale to their customers. And home bakers can work with grocery stores or other retail outlets to sell their goods. Passage of HB 1926 could be a huge boost for small businesses. Registration with, and inspection by, state or local state health department. Food safety training for personnel. Health restrictions on food handlers. Sanitation measures, such as keeping food for sale separate from that for personal use; cleaning surfaces, utensils, and equipment; excluding pets; and maintaining foods at safe temperatures. Record-keeping of all food sold and locations products are sold. Labeling of ingredients and a notification that the food was prepared in a home kitchen. Additional regulatory provisions for low-acid canned foods, acidified canned foods, and fermented foods, to ensure safe recipes are used. The bill addresses food safety concerns in a scale-sensitive manner, allowing for safe home food production and sales. This benefits not only producers, but also consumers, who receive improved access to healthy, locally produced foods. Read the entire text of HB 1926 here. Call or email your State Representative to urge him or her to support HB 1926 and help move the bill forward. A phone call has the greatest impact and allows you to find out if they supported the cottage foods bill in 2013 (if they were in office). Remember to keep the conversation polite and to-the-point. If you prefer email, your Representative’s email address is simply FirstName.LastName@house.texas.gov.